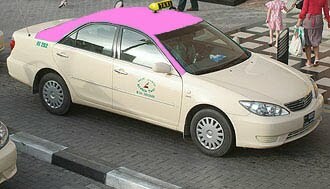 Lucky you if you were not with the blogger in the same car in the early days of her driving!Now she's better in her Pink Taxi,than many of the Pakistani taxi drivers that she encounters on daily basis on the highways of Dubai. She did not mention her dreadful driving experience in France,behind the wheels of the household 1982 blue Merc station wagon.Taking her siblings on the winding roads and tunnels leading to the daily pilgrimage to Cannes! Her VW Towareg was transformed into a sour lemon,in less than a year,destroyed by her brood of children,shuttling from one activity to the other.You don't want to imagine the various musical and sport instruments all lumped in a messy pile. In transition from the limo feel of her chic Beamer,she will go back to destroy with the help of her kids,the impeccably- used Lexus 470 , 4WD 2000 model,the age of her first offspring! Dear blogger, you forgot to mention the AC not working in the Touareg year round and the smell of sour milk. I fondly remember the Yazzmobile in Boston. We had lots of fun! I write as your jealous sister who only received her first car in her second year of law school, and it was a Jetta not a BMW :( But I did love it, and I do remember the feeling of freedom that came with it....My husband just gave me a little mini to drive in NYC and I have finally gathered the courage to maneuver around crazy taxi drivers, buses and delivery boys on bikes. I feel like NYC driving is like playing a video game.....But I do feel happy that I finally did it! It turns out it's not so bad, especially in a tiny car.